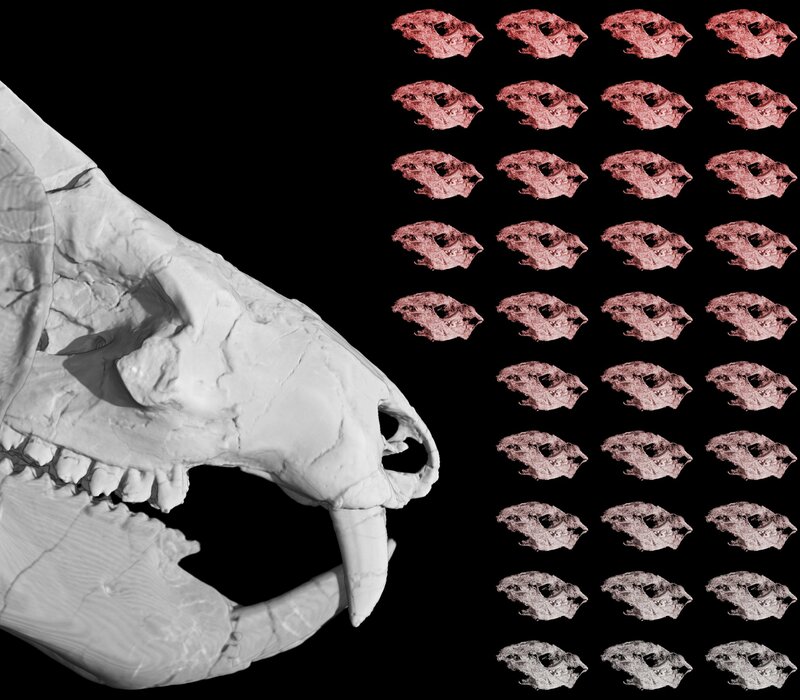 Scientists have discovered the skulls of 38 babies buried in the ancient fossilized remains of an extinct mammalian precursor – the only such fossil ever discovered. The team thinks about their research, which was recently presented at the 78th Annual Meeting of the Society of Vertebrate Paleontology, could help explain how mammals traded hordes of offspring for larger brains over the course of millions of years of evolution. The research was also published earlier this year in the journal Nature . A member of the Kayentatherium wellesi species – dog-sized herbivores that lived 185 million years ago – has a lot in common with mammals. You may even have hair. But they differ in some crucial ways. Most importantly, the fossil family reproduces the old animal, which was more like a reptile bred. She produced large eggs with many babies instead of giving birth to only a few. Mammals just a few million years later "undoubtedly had big brains, and they undoubtedly had a small litter size," University of Texas researcher Timothy Rowe said in a statement. Researchers discovered the baby skulls at random, years after the remains had been discovered in Arizona. The then doctoral student Sebastian Egberts discovered about 9 years ago a glimmer of unexplained enamel. "It did not look like a sharp fish tooth or a small tooth from a primitive reptile," said Egberts, who teaches anatomy in Philadelphia College of Osteopathic Medicine. "It looked more like a molar tooth (molar-like tooth) – and that got me very excited." Advances in image technology finally unveiled the babies, who are "a really important point in the evolutionary tree," according to Eva Hoffman, who led the research as a graduate student while attending the University of Texas. Scientists expect that advancing technology will further illuminate the intricacies of evolution. In other fossil news, scientists have recently discovered an ancient, carnivorous fish that lived about 150 million years ago. The piranha-like creature stamped its razor-sharp teeth on other creatures. Researchers have also found the smallest Diplodocus skull ever found. The "extremely rare" find was a great window into the youth of the gentle giants. A dinosaur species – Ledumahadi mafube – was also recently named after many years of study. This huge sauropod cousin, known as the Giant Thunder Clap at dawn, lived about 200 million years ago.